Fresh from reaching the knockout stages England's four Champions League group qualifiers have equally high-profile domestic duties this weekend as Manchester United host Arsenal and Tottenham Hotspur take on Chelsea. For the first half of Arsene Wenger's reign at Arsenal the team's clashes with United often went a long way to deciding the destination of the Premier League but the emergence of Chelsea as a major power knocked the Gunners down the pecking order. They last won the title in 2004 and have not cracked the top two since 2005 but they go into Monday night's game at Old Trafford proudly back on top of the league and bidding for their first win there for four years. Their key man in recent weeks has been Samir Nasri, who scored both goals in last week's 2-1 win over Fulham and another in the 3-1 win over Partizan Belgrade which sealed Arsenal's progress to the last 16 of the Champions League on Wednesday. The twinkle-toed France midfielder has been playing as a touchline-hugging virtual third forward this season and Wenger is delighted with his contribution. "He has become more efficient and is maturing but he is only 23 and at that age you develop," he said. "He is an intelligent player and understands that he plays where he can help the team the most. He has all the ingredients to play on the right, left or central and he is happy to play where I play him. Everyone wants to play in the middle but a few have to play on the flanks," he added. 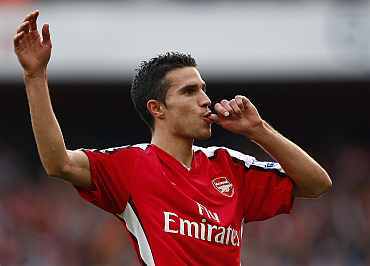 The return to fitness of Robin van Persie further adds to Wenger's attacking options, but things are not so rosy at the back. With Thomas Vermaelen not due to return from injury until the New Year, Arsenal have looked shaky in central defence, not least when Laurent Koscielny and Sebastien Squillaci crashed into each other to gift Fulham an equaliser. 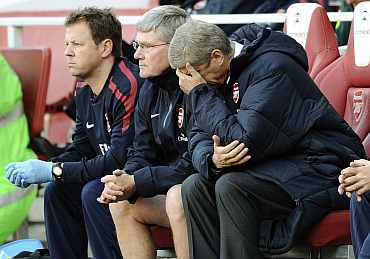 "We struggle in defence so we have to score more than we concede," forward Andriy Arshavin said. "It's very frustrating and we're trying to improve. Normally I can't go through our defenders in training but we can't blame just them, we need to improve defensively as a team," he added. United are a point behind Arsenal with a game in hand and though they have struggled on the road this year with six draws they have been superb at home where they have won seven and drawn one of their eight games. Chelsea have slipped to third after picking up just five points from their last six games and things are not about to get any easier as they follow Sunday's tough trip to Spurs with games against Manchester United and Arsenal. 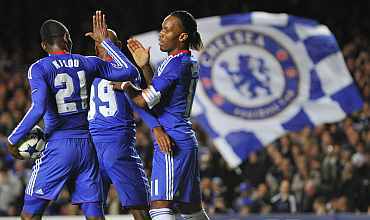 Even the return of John Terry and Michael Essien after lengthy injury layoffs last week could not shake Chelsea out of their torpor as they gave up a late equaliser in a 1-1 home draw with Everton. It was no better in Marseille on Wednesday when Chelsea lost their 100 per cent Champions League group stage record in a 1-0 defeat to the French side. "I knew we would have a bad period but I didn't think it would last this long," said manager Carlo Ancelotti. "Obviously I'm worried, we have to do better," he added. For many years a trip to Spurs would at least have guaranteed a return to winning ways for Chelsea but Spurs have won three and drawn one of their last four White Hart Lane meetings. Manchester City, sitting between Chelsea and Spurs in fourth place, three points off the lead, will hope to gain ground with a win at bottom club West Ham United while also on Saturday Liverpool will bid to maintain their surge up the table when they visit a Newcastle United side still reeling from the sacking of manager Chris Hughton.